Ethical management and corporate governance are about balancing the competing needs of all of the organisation’s stakeholders, balancing long- and short-term goals and being socially responsible, also known as exercising corporate social responsibility (CSR). The good news is empirical studies consistently show organisations that focus on these objectives also consistently outperform those seeking excessive profits in the short term. However, this sort of long-term, sustainable success is not achieved by the simplistic win-lose scenarios favoured by many MBAs. It needs mature, pragmatic governance and a focus on win-win. Successful organisations survive and thrive because they understand the only effective long-term strategy is to help their customers succeed in their ambitions. So when the customers win and society wins, the organisation wins. Focusing on customers and society at large may seem at odds with the first and fiduciary duty of the directors and managers of any commercial business which is to optimise the long-term benefit of its investors/shareholders. The key element though, is ‘long term’. In the short term, the profits generated by Barclays Bank (or more accurately for managers within the bank) through the manipulation of the LIBOR index must have seemed attractive, the $500 million fine and the crash in share prices following the scandal have damaged the financial security of thousands of innocent shareholders. A similar short-term approach focused on cost cutting and profits, but without overt illegal activity, destroyed billions of dollars in value for BP shareholders as a result of the Deepwater Horizon disaster. Ill-informed cost cutting compromised safety and value was destroyed. Less dramatic, but equally damaging was the destruction of the US car industry. General Motors and the other big US car manufactures spent most of the last 20 years responding to short-term imperatives such as the quarterly share price and executives bonuses at the expense of the health of the business and the long term-wealth of their stockholders. The net result, GM stockholders lost everything, and stockholders in other US vehicle manufacturers have lost almost everything. In contrast, Toyota’s stockholders are probably quite pleased with the long-term strategic decisions their management made. Toyota had a far better strategy for its business survival working on developing low emission, fuel efficient cars years before they became generally popular. The initial decision to invest in these new technologies had to have been at least in part driven by the desire to benefit the environment: there was certainly no compelling commercial reason at the time the decisions were made. 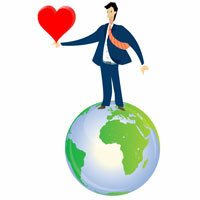 Similar debates also surround investments in CSR. Statistically, organisations that embrace CSR consistently do better than those that don’t; what is not so clear is if this measured improvement in performance is a result of investing in CSR or if the internal factors that create a sustained level of improved performance also predispose the organisation to CSR. Either way, the ‘good guys’ do consistently win! I may be biased but my feeling is the touchstone that facilitates an effective focus on long-term sustainability, CSR and excellence in client services is the way organisations engage with their stakeholder community. A genuine engagement means caring about the other party and looking after their interests as well as your own. This is a two-way street and underpins customer loyalty, brand image and long-term sustainable growth. Developing a mature, balanced and pragmatic approach to stakeholder relationships is hard work but this investment seems to be the underpinning needed to allow the optimum balancing of competing demands and opportunities, leading to the practical decision-making needed to create the long-term, sustained growth identified above. Achieving the level of maturity needed to effectively engage with an organisation’s stakeholders to the benefit of everyone has to be driven from within the organisation’s culture. But simply wanting to ‘do good by doing good’ is not enough! The desire to engage effectively with your stakeholders needs to be backed up by hard work. There is a maturity ladder to climb. Download the Stakeholder Relationship Maturity Model for free here. A final ‘chicken and egg’ conundrum: changing behaviour will change attitudes and culture, but you need a desire that is embedded in culture to start on a journey of improvement. Beginning the improvement is the hardest bit of any change initiative. Dr Lynda Bourne PMP, FAIM, is an international authority on stakeholder engagement and the Stakeholder Circle visualisation tool. She is the author of 'Making Projects Work' (2015), 'Advising Upwards: A Framework for Understanding and Engaging Senior Management Stakeholders' (2011), and 'Stakeholder Relationship Management' (2009) and a contributor to many others. Lynda Bourne has written 60 articles for us. I read about you and took interest in your two books that you have published-Stateholder Relationship Management (2009) and Advising Upwards. Is it possible to get an online copy of these books or buy them online? I will be glad to hearing from you asap.